I say, old chap. Pull up a chair. My manservant here will pour you a glass of gin and lime whilst I regale you with the true story of how interracial love conquered our beloved British empire. The year is 1947 and Seretse Khama (David Oyelowo, SELMA; A MOST VIOLENT YEAR; LEE DANIELS’ THE BUTLER), the king of the British Protectorate of Bechuanaland, is studying law in London. Seretse’s uncle has ruled the country as regent since the death of Seretse’s father when the young man was just four years old. At a church dance, Seretse meets Ruth Williams (Rosamund Pike, GONE GIRL), a delightful, young British woman who works as an office clerk. It’s pretty much love at first sight for these two. They date for a year and, when Seretse is called back to Bechuanaland assume his throne, he proposes marriage. Both Seretse and Ruth know it won’t be easy going though. To start, there’s the whole intermarriage thing, which is just not accepted here in England. Even Ruth’s father is not happy (and that’s an understatement) when she tells him her news. Can you imagine? First India gains its independence and now this! Then there is Seretse’s tribe, the Bamangwato, whose customs forbid its king from choosing his own wife. Finally, there’s the South African government, which is in the process of institutionalising racial segregation in its own country, known as apartheid. Imagine their apoplexy at the mere thought of having a black king and a white queen on their doorstep! If it weren’t for South Africa’s vast reserves of gold and uranium, we would kick the country out of the Commonwealth but what can we do? We’re still recovering from the devastation of WWII. Instead, our government sides with South Africa and pressures the couple to break up. Seretse and Ruth are steadfast in their union though. We then decide to punish Seretse by exiling him back to London while Ruth remains at their home in Bechuanaland. Seretse, though, doesn’t take matters lying down. With the help of young Labour MP, Tony Benn (Jack Lowden), and under pressure to back down from the British public at home, the people in Bechuanaland, and the hypocritical Yanks across the pond (who have their own segregation issues to deal with, let me remind you), our government finally agrees to let Seretse go home, provided he renounce his claim to the throne. But Seretse is not done with us Brits yet. No sooner does he step foot in his country, he declares that they will seek independence from the Empire. Of all the cheek but what can we do? We stupidly gave them their country’s mineral rights. 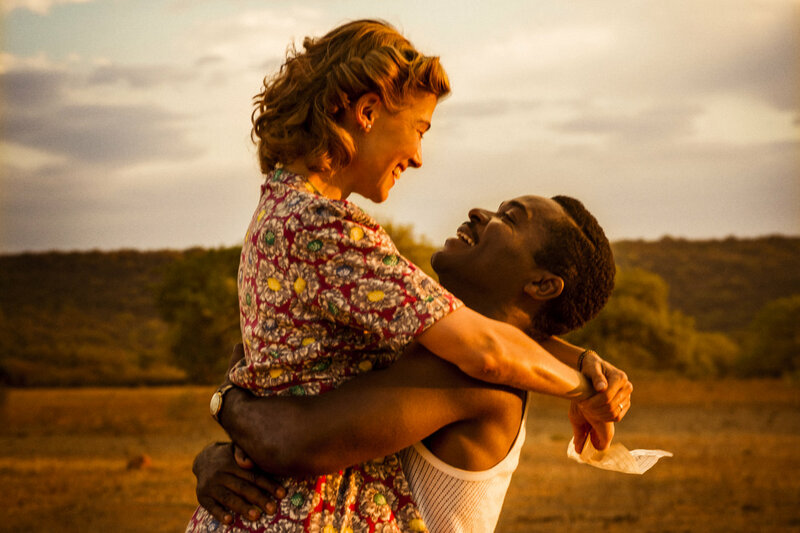 Amma Asante’s A UNITED KINGDOM recounts the story of Seretse and Ruth in much the same “look at us, weren’t we awful back then” manner. It’s all very by the numbers, with few dramatic bumps in between. Sure, there are a couple of impassioned speeches delivered by both Oyelowo and Pike that have “BAFTA award bait” written all over them but the rest of the movie lacks sufficient flavour. The scenes where the couple is dancing to jazz music crackle with excitement but Asante can’t seem to build onto it. She may have been looking to Jack Davenport (the PIRATES OF THE CARIBBEAN franchise) and Tom Felton (the HARRY POTTER franchise), who play the film’s villains (Davenport as the fictional Sir Alistair Canning and Felton as the equally fictional Rufus Lancaster, two British government officials in Bechuanaland), to spice up the story, but the two come off as stereotypical British colonial civil servants. (Oyelowo’s real-life wife, Jessica, plays Canning’s wife.) Fortunately, Oyelowo and Pike are both superb actors who consistently deliver quality, and their performances here save this film from sinking into the Thames. While there are a few scenes that deal with the interracial aspect, they are done so rather lightly, as if it’s an inconvenience rather than the moral outrage that it was deemed at the time. Curiously, Ruth’s parents knew that she and her sister were going to these dances where African men would be present. What did they expect would happen? It’s unfortunate that the story didn’t go deeper in that direction. On the plus side, the African scenes were filmed on location in Botswana, and the couple’s house that was used in the film was the Khamas’ real house. The hospital used (where Ruth delivers their eldest child) was also the real hospital. A UNITED KINGDOM is an okay film – not great but not bad — and it’s a good history lesson. Check it out if you’re on an airplane otherwise wait for the DVD or VOD. Fans of DOWNTON ABBEY will be pleased to see one of their favourite actors in the cast.